Spot the tiny shrimps hiding in the sand, see a shy crab underneath a rock and watch a jewel-like anemone open its tentacles in this gorgeously illustrated book of natures hidden habitats. 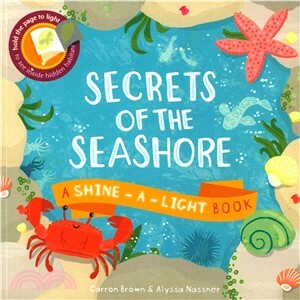 By simply holding the book up to the light, or shining a light behind each page, young children will be able to discover the animals and plants that live in and around the oceans edge, from the fish and seaweed in the water to the birds that feed there. The innovative see-through device fulfils a similar function to lift-the-flaps books, but has the added interactive dimension of the child being able to see both the surface and the hidden picture at the same time. (Carries EU Toy Safety Directive 'CE' logo).